Please enjoy this cute little printable for your fridge. 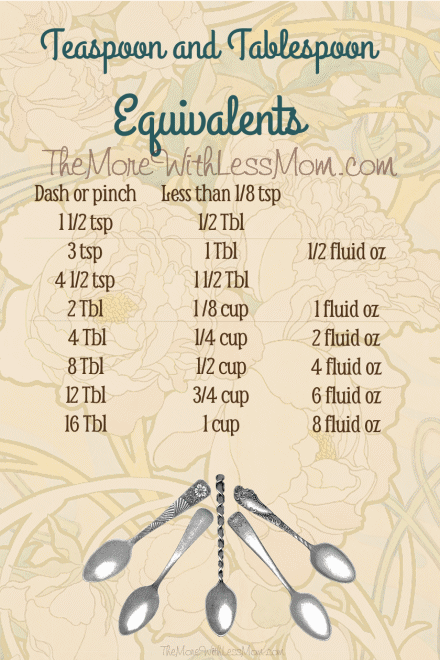 It has teaspoon and tablespoon equivalents. When you cook from scratch for a large family you are constantly multiplying measurements, and this can come in handy if you are allergic to math. Not that I would know anything about that. This is the size of a large index card, 4″ by 6″. You can put it on the fridge or use it as a bookmark in your cookbook. 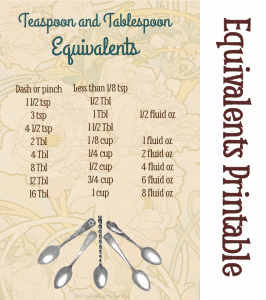 The vintage spoon graphic and more can be found at The Graphics Fairy. What kitchen helpers do you always keep handy? 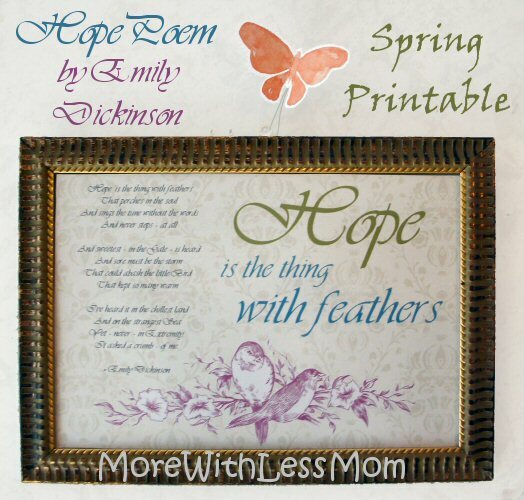 Thank you so much for creating and sharing this lovely printable- so helpful! Love this! I am constantly having to google measuring conversions. Would go nicely on the pantry door. Thanks for sharing! It is super nice to have Google to ask, instead of doing it yourself and flubbing it. Thanks for this! I am indeed allergic to math 🙂 I have been stuck in the kitchen too many times staring at a recipe and trying to figure out how to change the portions. Thanks! The worst is when you think you did it right and then the recipe doesn’t come out. How useful – thank you. This is a really handy printable! Thank you for sharing it with us at the Hearth and Soul hop. Pinning and tweeting! I think it’s adorable, it’s on my fridge. This is great to keep handy when we are cooking together! 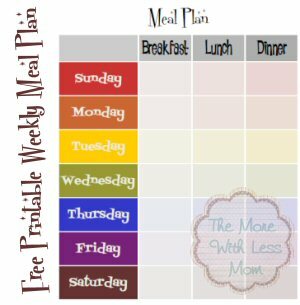 Your post has been featured on this week’s Frugal Family Linky via Peakle Pie! Hope to see you joining in again soon and remember to pop by and grab your ‘I’ve been Featured’ badge too! Why thank you! I’ll be sure to come over!